EDIT: dErase v2.0 just released with a user interface and combining both executables. 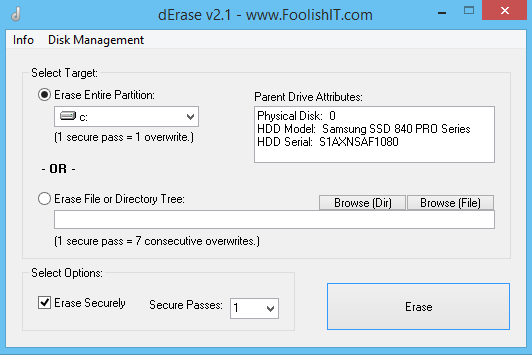 The freeware dErase is a tiny app designed for one purpose only, to delete files and/or directories, with optional secure deletion routines. Simply drag n’ drop the file or directory tree you want to delete onto the dErase executable to select that object for deletion. What makes dErase different from standard delete utilities, is that it will ignore file system ownership/permissions entirely while deleting.